This PIMCO Dynamic Credit Income Fund (PCI) objective is to provide current income with capital appreciation. This fixed income fund uses its assets to purchase multiple fixed-income sectors in the global credit markets, including corporate debt, mortgage-related and other asset-backed securities. This bond closed end fund is a leveraged, tax-paying closed end fund. 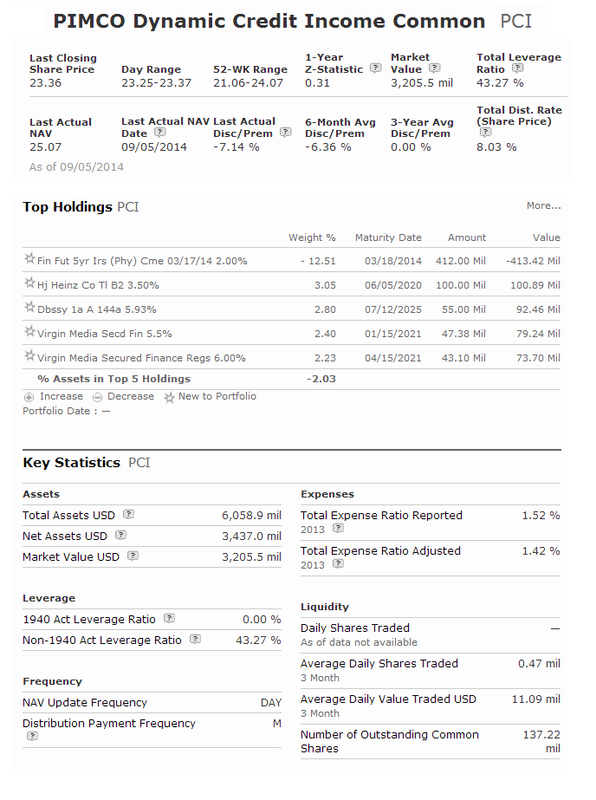 This PIMCO Dynamic Credit Income Fund has a high yield of 8.03%. This distribution rate is paid every month. The fund managers Sai S. Devabhaktuni, Daniel J Ivascyn, Mark Kiesel, Elizabeth O. MacLean, and Alfred Murata since 2013. This bond fund has net asset value of $6.06 billion. Its current share price is $23.28. The fund sponsor is Allianz Global Investors Fund Management LLC. The annual expense ratio fee is 1.39%. This multi sector fund hasn’t been ranked by any major financial company such as Morningstar or Lipper. In 2014, the year to date return is 9.33%. This PIMCO Dynamic Credit Income Fund has a 1 year annualized return of 20.06%. This stock fund has 514 holdings in its portfolio. The average coupon is 8.24%. Top 5 holdings in its portfolio are Hj Heinz Co Tl B2 3.50% 3.50 05 Jun 2020, Dbssy 1a A 144a 5.93% 5.93 12 Jul 2025, Virgin Media Secd Fin 5.5% 5.50 15 Jan 2021, Virgin Media Secured Finance Regs 6.00% 6.00 15 Apr 2021, and Lloyds Bank Plc Jr Sub 144a. Closed end funds (CEFs) are traded like stocks or ETFs (Exchange Traded Funds). You can buy from your stock brokers including ETrade, Interactive Brokers, TD Ameritrade, Fidelity, etc. Invest with as little as 1 share is possible. This PIMCO Dynamic Credit Income Fund is managed by several well-known PIMCO managers. It has a high yield for income seeker. This multi sector bond fund is relatively new; hence there is very little history. Its expense fee is a bit high at 1.39%.